Here is a great gift for your Cardinals fan. Birthday, Opening Day and more! 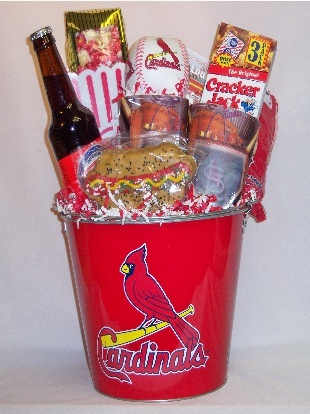 Cardinals Ice bucket is filled with popcorn, peanuts, Cracker Jack, 2 Cardinals cups, a bottle of Fitz's rootbeer, a stuffed baseball and a chocolate covered rice krispy treat hotdog.